By using downriggers anglers can deploy and troll natural and artificial baits at a steady position in the water column and target the strike zone, as defined by hard bottom, structure, bait, water temperatures or fish marks on the sounder. Kingfish anglers typically run at least one downrigger, unless they're fishing shallow waters off the beach. In deeper areas, varying your spread with surface rigs and deep baits let you cover a wide range of depths and entice more bites. As migratory pelagics, king mackerel are constantly on the move on the hunt for bait and they will move up and down in the water column. 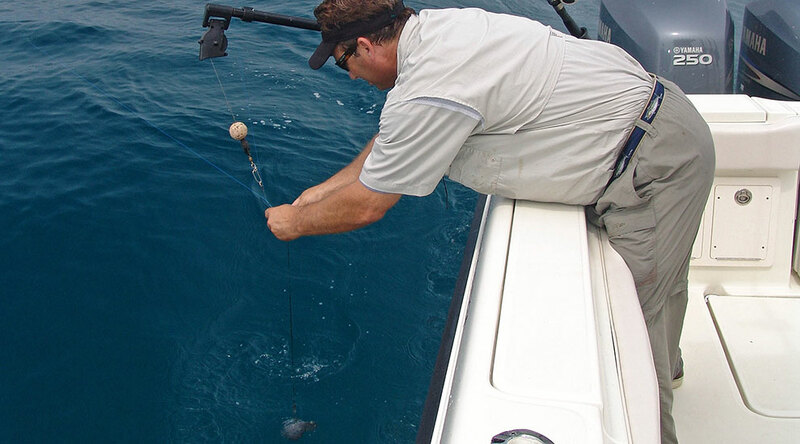 Downriggers offer an effective method to fish your baits at specific depths. 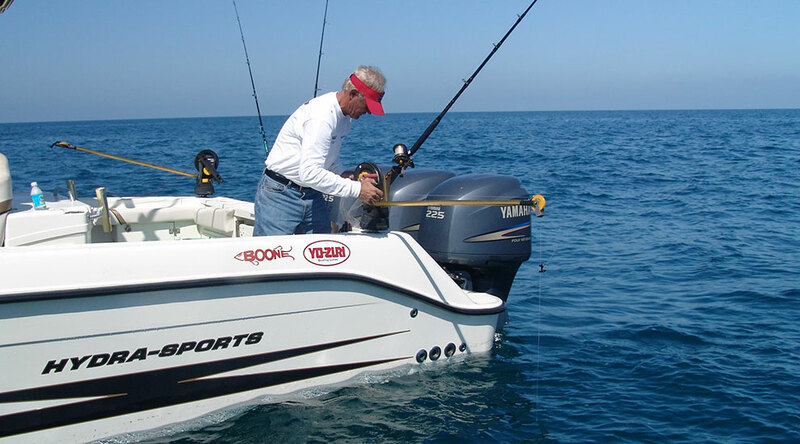 Set in a transom rod holder, a downrigger typically includes a rod holder, a handle or electric cranking system, a boom and a swiveling base. The first step is deploying the downrigger ball or weight into the water and attaching the fishing line to the release clip. 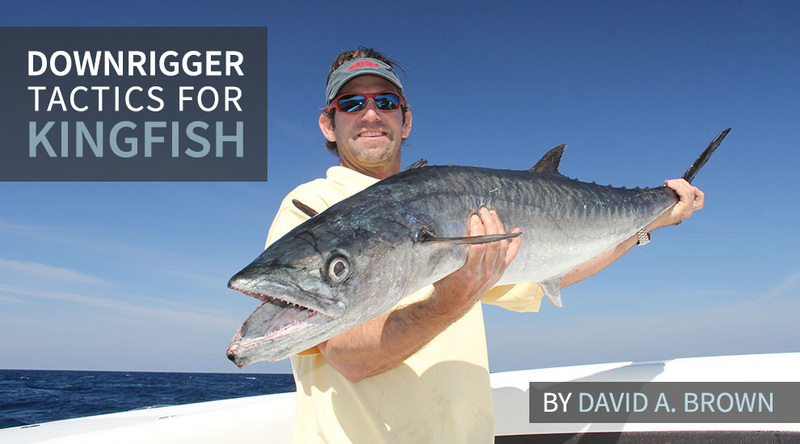 Most kingfish anglers will run their baits at least 20 to 30 feet behind the weight for optimal presentation. Once the fishing line is secured into the downrigger clip, lowering the weight requires a coordinated operation. 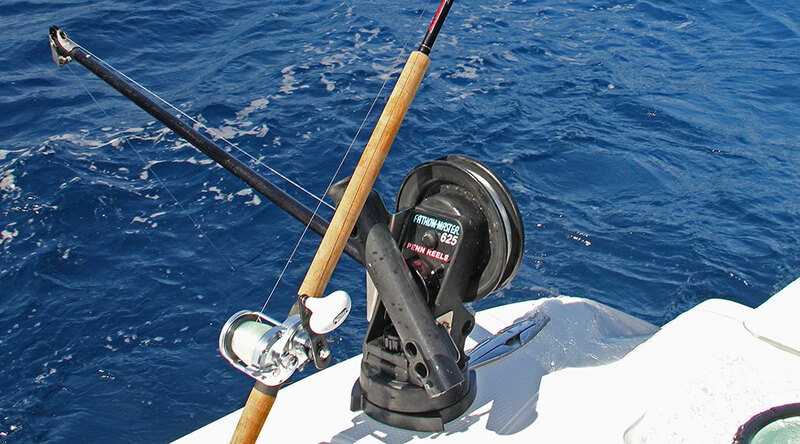 You should balance the weight's descent with thumb pressure on the fishing reel. Drop the weight too fast and the release clip will pop free. Leave the reel too loose and you risk a backlash when you stop the weight. When attaching the line to the release clip, you'll want to make a loop (left). With the bait deployed out from 20 to 30 feet, grab the fishing line and form a loop about 8 to 10 inches deep. Twist the loop five to seven times and then secure it in the release clip. This is a more secure connection than clipping in a straight line. 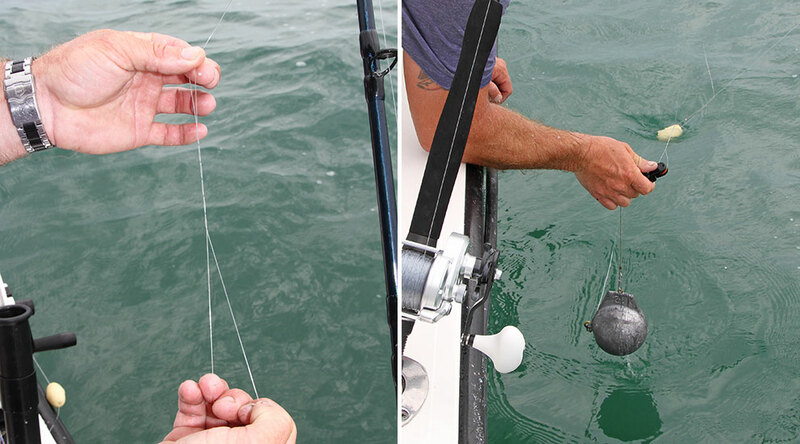 When setting baits, keep the boom angled outward (right). Also, let the ball hang at or just below the surface so the water limits its mobility to keep the ball from crashing into your gel coat. This is particularly important in rough seas. Anglers troll a variety of baits off downriggers, but typically, this is where you want to use one of your largest baits. 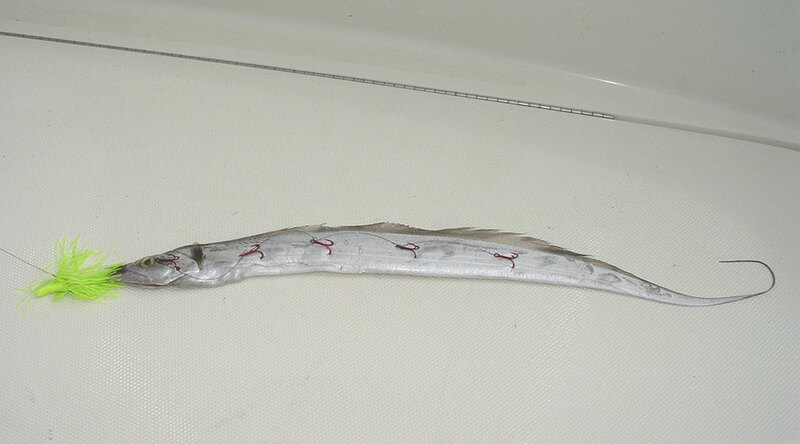 Big kings will certainly bite flat-lined baits, but they like to hold deep, so presenting hefty targets like ribbonfish on a downrigger is a good bet. 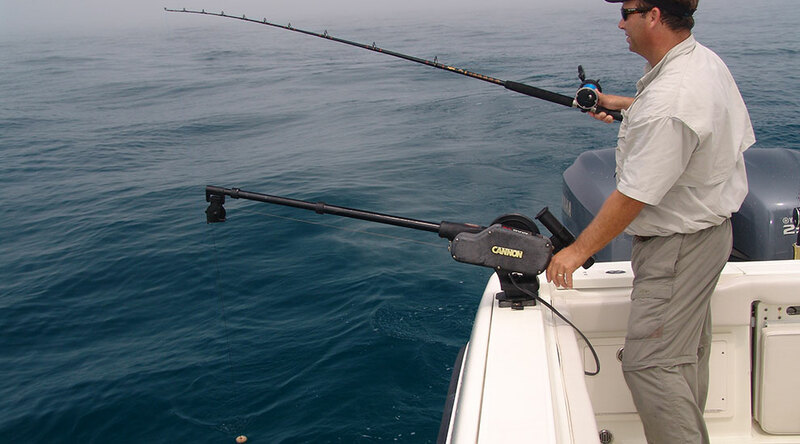 Angle the downrigger boom outward in the trolling position while securing the fishing line in the release clip (left), giving yourself plenty of space to work. Downrigger weights vary in size and shape (right). 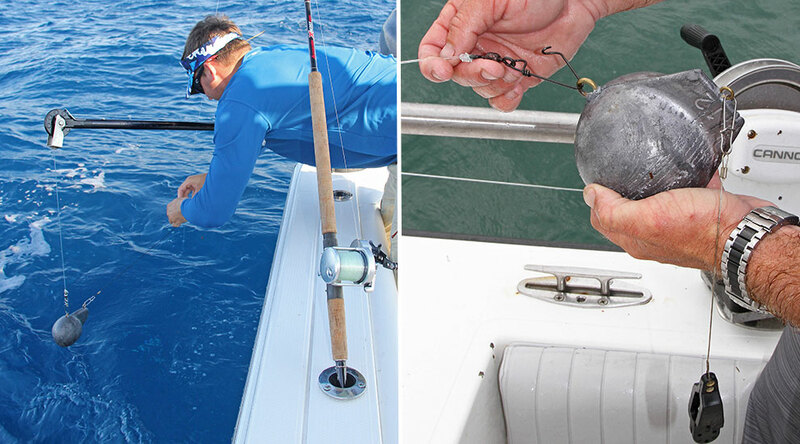 Some feel the aquadynamics of a fish-shaped downrigger weight help prevent blow-back, but many believe a standard cannonball-shaped weight works just fine. It helps to bring a spare downrigger weight, and multiple weight sizes on board to fish different depths. When running from spot to spot, you'll want to secure your downrigger ball so it doesn't bounce around and damage your deck -- or break someone's ankle. 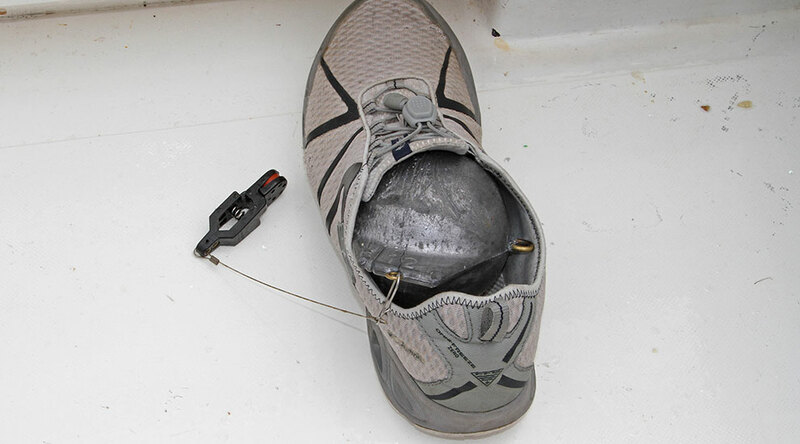 Keeping the weight clipped to the cable and dropping it into a bucket is one option, or you could lay it inside a boat shoe. This keeps the weight secure and handy. 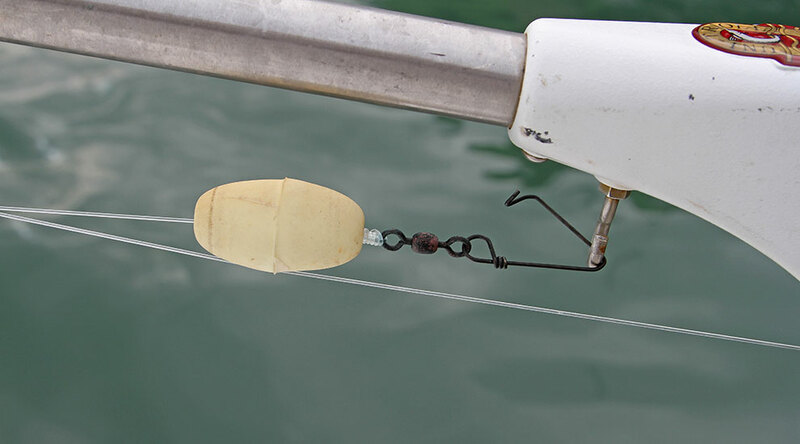 A cork or some other type of spacer positioned above the clip that connects to a downrigger weight is a key piece in the setup. When a kingfish bites, everyone's scrambling in the heat of the moment and it's easy to inadvertently reel the weight right up to the edge of the boom. A cork spacer minimizes the impact and prevents damage. Although most downriggers are designed with rod holders built in, a lot of seasoned kingfish tournament anglers don't trust this position. 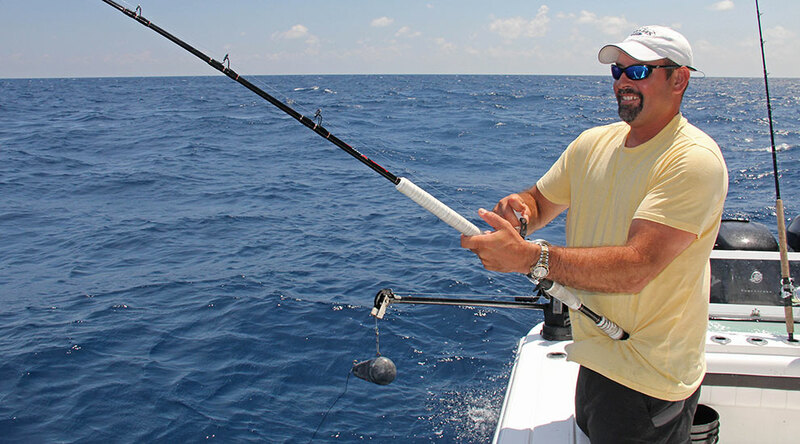 Many prefer to stick their rod in a gunwale rod holder. The thought here is that there's much less chance of a rod slipping out of its holder. 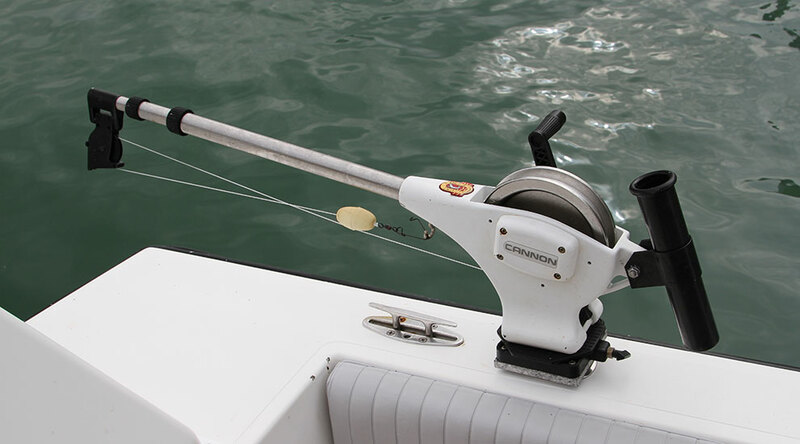 Also, most prefer their downrigger rods angled toward the stern, rather than perpendicular to the boat. When the operation goes as planned and your downrigger attracts a big king, the sound of a line snapping free from a release clip is like a starter's pistol. One angler grabs the hot rod, while a teammate cranks up the 'rigger weight. Then, it's off to the races. 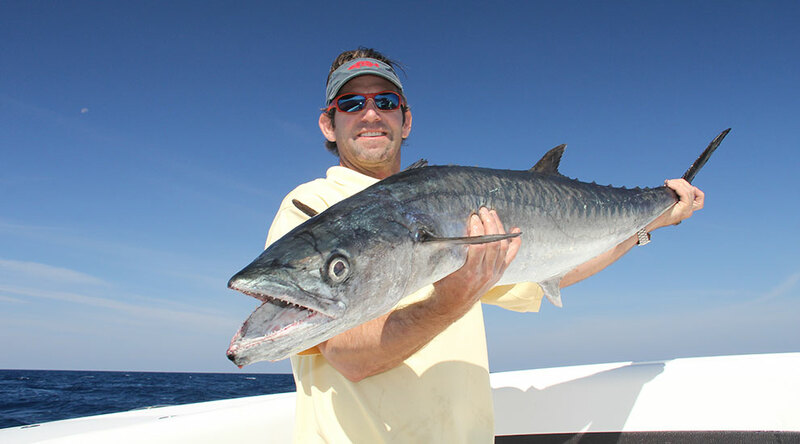 This big Gulf of Mexico king mackerel ate a plump blue runner fished off of a downrigger in about 100 feet of water. In such depths, most kingfish teams run twin downriggers at staggered depths. A general rule of thumb places one downrigger weight about halfway down and another about halfway past the first.